The tiny house movement, its enthusiast’s, founders, builders and advocates may just be my “home”. They get me, they champion me, they help me, they celebrate the sustainable tiny life with me. And more than that, they get, and champion each other. It is an inclusive group, all ages, types, kinds, levels of ability. A sustainable group. They embody the soul of the two quotes above. Let’s back-up a minute. Growing up in the Midwest in the late 1950’s and early 1960’s, my childhood was inculcated with the American Dream of owning one’s own “home” in the nation of “equality, democracy and material prosperity” where upward mobility and pursuing your “bliss” were a “given” that you had succeeded in life. You know the words we were taught in grade school, “life, liberty and the pursuit of happiness”. Today for millions of Americans, including myself, the American Dream is looking a lot different. The Great Recession affected all of us. Debt is so embedded into the fabric of our society that millions have lost their homes, jobs, retirement, and their financial and social stability. I am sure Wall Street had quite a bit to do with the foreclosure of the American Dream for most of us. A large number of us nearing retirement, have lost our savings in the recession and can no longer retire. Others of us lost everything paying health bills for chronic illness and cancer due to toxins in our consumer products and the polluted environment. Yet how can we achieve financial or social stability in a society that thinks the labor force or the older American (over age 50) is “irrelevant”, “of no value”, “unproductive” or “health-cost prohibitive”? “The flood of “micro-aggressions” towards older employees in the workplace is astounding.” Corporations could engage and educate their workers by fostering an ethic of inclusion (think best sustainable practices) but few do. Are they aware that someday they will be our age too? (You can see more details about my personal experience with this in the 2008-2010 archives on terrabluteams.org). Surviving ageism in the workplace and discrimination for being a disabled adult, I made the positive future-forward decision in 2008 to find my own solution. I started a customized 5-year plan to recreate and manifest a deeper sustainable tiny life. Home, to me, is wherever I am. It is an authentic life of integrity, joy and peace. It’s a mindful life in balance with nature and living creatures. My net zero Silver Bullet tiny house on wheels, when its finished this summer, will be the manifestation of my new “livable American reality”. 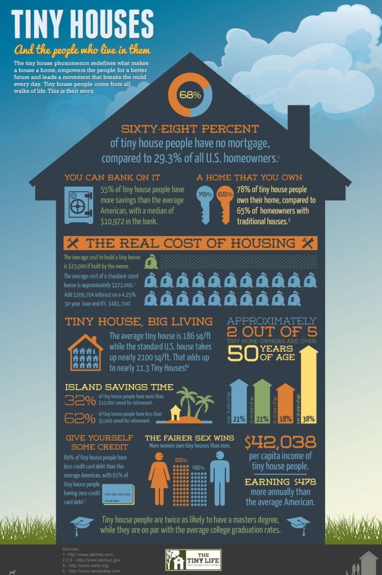 I believe “The tiny house movement has been growing for a decade and it is the sustainability imperative at work”. I can hardly wait to take the Silver Bullet on tour across the country to inspire and help others learn about the joy and rewards of living the sustainable tiny life. As an environmental and social activist I was considered a “hippie” during the late 1960’s and 1970’s. In his article “The American Dream Is Dead; Long Live the New Dream” Cliff DuRand, Truthout columnist, posits that upward mobility is dead. Struck, Vera, Standing on the Shoulders of Giants, 8/28/13 blog article from tinyhouselistings.com. 38% of tiny house dwellers are over age 50. You can read all about the joys, rewards and challenges of our founder’s tiny house build and sustainable tiny life journey at silverbullettinyhouse.com. We would like to thank everyone for their support of our new sustainability non-profit on Facebook, Twitter, our Indiegogo campaign and our website. 6. Engagement of thousands of middle school, high school and college students in dialogues about sustainable best practices. Again, thank you for all your feedback, support and interest in becoming sustainable practitioners. Please comment here on what sustainability practices from this website inspired you this year! If you would like to drop us a line, we would love to hear from you! On July 11th global citizens will observe World Population Day. Did you know that in 2011 the world population surpassed the 7 billion mark? One of the greatest challenges we face today is figuring out how we are going to sustainably use our remaining limited resources while allowing future generations to meet their needs. • Population dynamics are not destiny. Change is possible through a set of policies which respect human rights and freedoms and contribute to a reduction in fertility, notably access to sexual and reproductive health care, education beyond the primary level, and the empowerment of women. This week’s practice is to empower yourself with the capacity to change your unsustainable behaviors. Not because you need “points” from a gamification website or the green initiative software at work, or because you will avoid fines, penalties, carbon taxes or imprisonment but because it is the right and healthy thing to do for yourself, family and community; and will leave a world inhabitable for your children and your children’s children. 1. Change one unsustainable habit at a time. 2. Make it simple, start small. 3. Write down a 30 day plan. 4. Ask for help and support as there will be sabotagers. 5. Become publicly accountable. Do it with a friend, a group, post it on your blog, write a column. 6. Exercise, rest and drink lots of water. 7. Use visualization, have a mantra and give yourself rewards. 8. Engineer it so it’s hard to fail. 9. Avoid situations and people that support unsustainable habits. 10. If you fail, try again. Obstacles can be overcome. Regroup, let go of guilt and just try again. So let’s just do it, embrace radical openness* and cultivate an evolved sustainable world. *Thanks to my colleague, Chris Brogan, for reminding me how much I love TED talks.